Get Programming with F#: A guide for .NET Developers shows you how to upgrade your .NET development skills by adding a touch of functional programming in F#. In just 43 bite-sized chunks, you'll learn how to use F# to tackle the most common .NET programming tasks.Examples use the familiar Visual Studio environment, so you'll be instantly comfortable. Packed with enlightening examples, real-world use cases, and plenty of easy-to-digest code, this easy-to-follow tutorial will make you wonder why you didn't pick up F# years ago FForewords by Dustin Campbell of Microsoft and Tomas Petricek of fsharpWorks. Get Programming with F#: A guide for .NET developers teaches F# through 43 example-based lessons with built-in exercises so you can learn the only way that really works: by practicing. 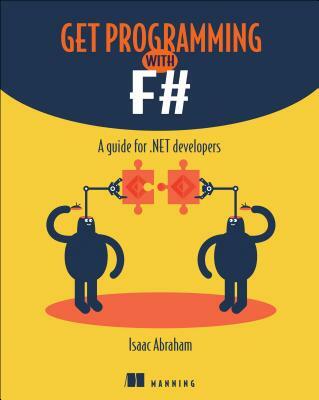 The book upgrades your .NET skills with a touch of functional programming in F#. You'll pick up core FP principles and learn techniques for iron-clad reliability and crystal clarity. You'll discover productivity techniques for coding F# in Visual Studio, functional design, and integrating functional and OO code. Written for intermediate C# and Visual Basic .NET developers. No experience with F# is assumed. Isaac Abraham is an experienced .NET developer and trainer. He's an F# MVP for his contributions to the .NET community. Unit 10 - WHERE NEXT?